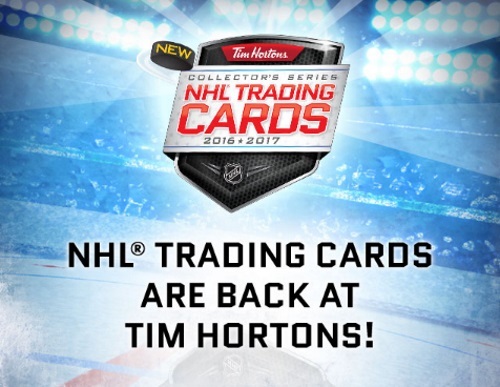 Tim Hortons Collector’s Series NHL Trading Cards are back! Purchase a pack in-restaurant for $1 with any beverage purchase. They’re only here for a limited time, so get ‘em before they’re gone! There’s also a chance to find 1 of 87 personally-signed Sidney Crosby autographed NHL Icon cards! Enter the in-pack PIN code online to receive a 3-card pack of Digital NHL Trading Cards. You can also get a free digital card every 24 hours! The more cards you collect, the more chances you have to be entered into draws to win* great prizes like: A trip for 2 to the 2017 NHL All-Star Weekend, EA Sports NHL 17 Playstation 4 Prize packs, $300 Shop.NHL.come gift cards, $100 Tim Cards and 120,000 instant win prizes.